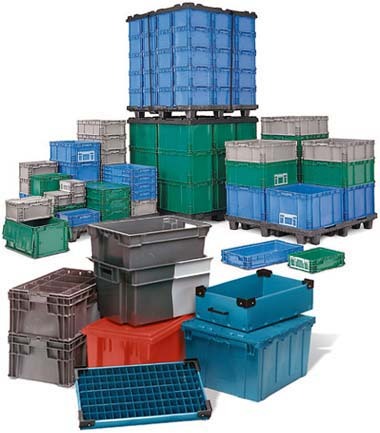 Straight wall, stackable, with lids or without – there are loads of totes and bins to choose from for small goods storage and order fulfillment. Variety is great, but when it comes to choosing the right tote it isn’t just about the products inside, it may have more to do with your carton flow rack application than you realize. Assuming you are going for the most efficient operation of your system, we say, “Test it!” Why take this additional step? Well, some plastic tote designs can actually work against you in certain carton flow applications. 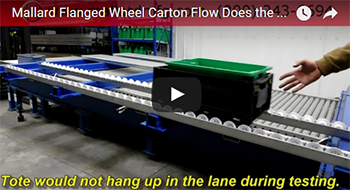 For example, a bottom overhang lip or ridge is almost sure to get hung up in traditional Cart-Trak or Dyna-Flo carton flow, but would flow very well in a flanged wheel carton flow system. 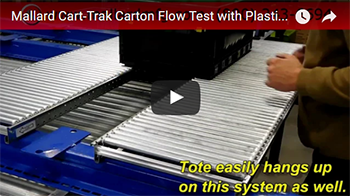 Check out our two testing lab videos that provide a visual comparison between these carton flow rack types. The tote has a lip at the bottom and our testing proves that this particular design causes hang-ups in traditional carton flow systems. The bottom lip falls between the rollers and impedes good flow even in the full-width roller Cart-Trak. So, what about a different configuration? Thankfully our engineers can quickly adjust the carton flow track configuration a two-rail set up. Again, we see that the tote has the same hang up issues on a two-rail set up. It is recommended that another tote design be chosen for use with these system applications. Ah, success! We know you know what we’re going to say now… Test, Test, Test! These videos serve as a perfect reminder that what may look good on paper may not always prove out on the warehouse floor. Many other variables exist when working with plastic totes not just the bottom design, but the rigidity of the plastic can come into play or the shape and size, so give us the opportunity to prove out the best and most efficient carton flow application for your needs. Testing can be done in our lab or even in the field, so give us a call and let’s set something up! It’s a New Year and a chance to get things started out right! Even better, let us test a few options for you in our Engineering Testing Lab before you commit to a single container type. Each test comes with a complete carton flow racking test report, video and engineering recommendations to help you make the best decision.